After 11 years of monkeying around with our kitchen towel & wash cloth, I finally came up with this idea and implemented it with Irene's approval. We both think it's the best solution for us. 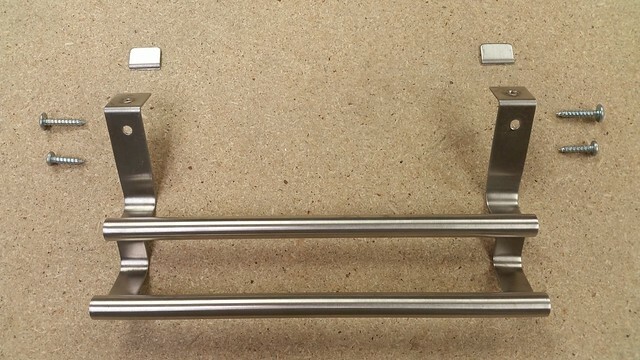 We considered mounting this towel bar on the lower cabinet door as it had been intended for, but given our no-slide quarters, we both felt it would be in our way there. 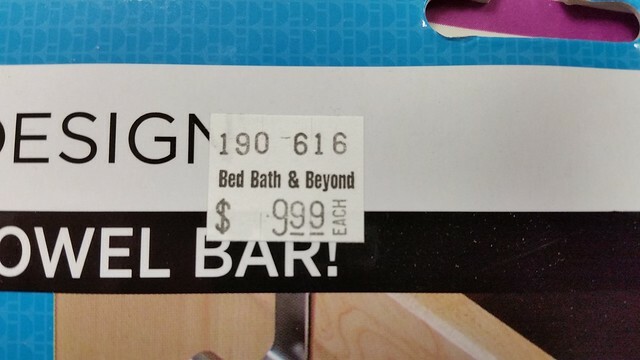 We bought it at Bed Bath & Beyond for $9.99 plus sales tax. I modified it, cutting off the hook portions and drilled holes. I screwed it first into the side, then into the top for a very nice tight fit. A single bar version is sold for $7.99, but I do "Not" recommend it for this application. This two-bar version sticks out nice and far for ease of use, yet not in our way getting in and out from our PC. Here are 3 pictures with towel and wash cloth. They hang beyond the main door opening as not to interfere getting in and out of the house.. 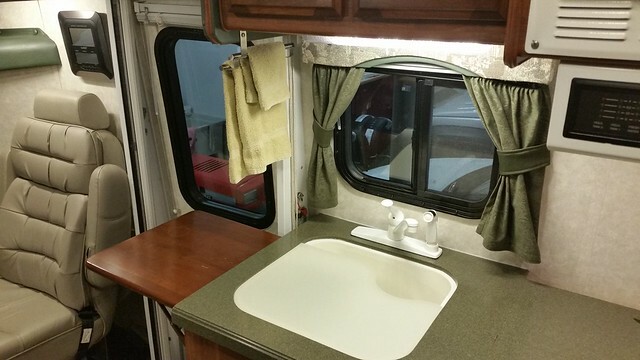 The towel and wash cloth hang right where they are needed, yet hang forward enough as not to be in your face. Great idea, thanks for the idea, we will pick up one at Bed Bath and Beyond this week. We are just getting our PC organized. 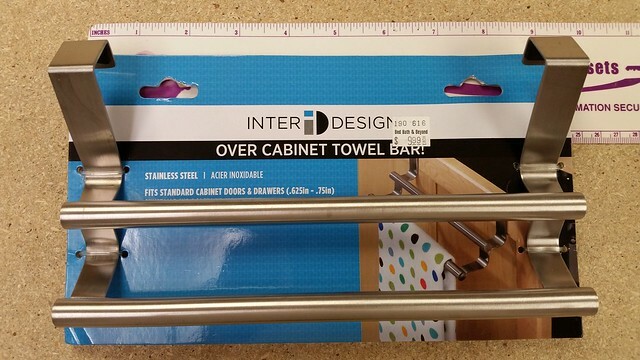 I have the same towel bar and it goes over the top of the under sink cabinet. I didn't modify anything except to add little fuzzy pads to it to protect the wood. 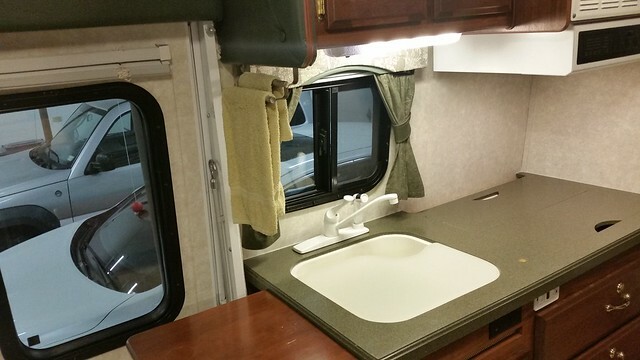 We flip it to the inside of the cabinet when we aren't in need of towels and back out for general use. We have a slide out so it is out of our walking path. I'm not sure I'd like the visual break in my face when I look in the door or down the length of the coach with Ron's set up but to each his own. I'd try it over the cabinet door first and if that doesn't work, start modifying. I personally try to avoid adding screw holes to the rig. I am 100% with you when it comes to drilling holes in our rig. It took a long time for me to come to the decision for this towel bar. Hanging our kitchen towel and wash cloth had been an ongoing issue for us for many years. We would string a rope across the entry which hooped on cabinet door knobs. 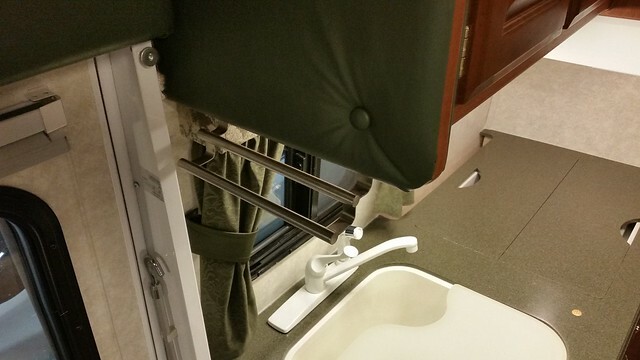 It had obvious challenges, we feel in worse ways than hanging the towel as shown. 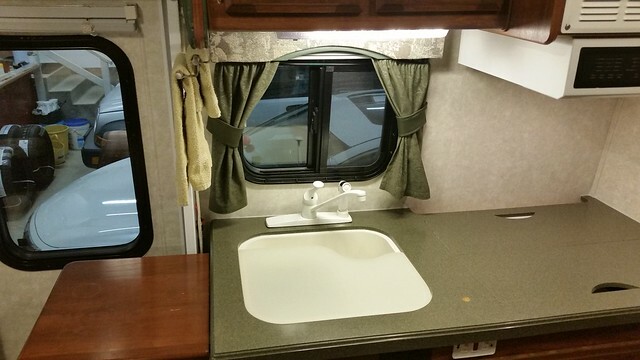 The towel bar is mounted as close to the wall as possible, away from the person's face when standing at the sink. It works. 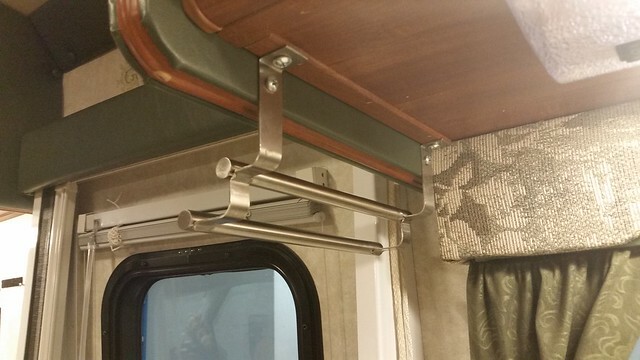 We clip one or two onto whatever needs hanging and hook them over: cabinet knobs, shower enclosure, towel bars, awning arms, tree branches, etc. To store them I clip them to each other in a chain and hang them in the wardrobe. We do not leave them up against the wood while traveling as I suspect they might swing and damage it. 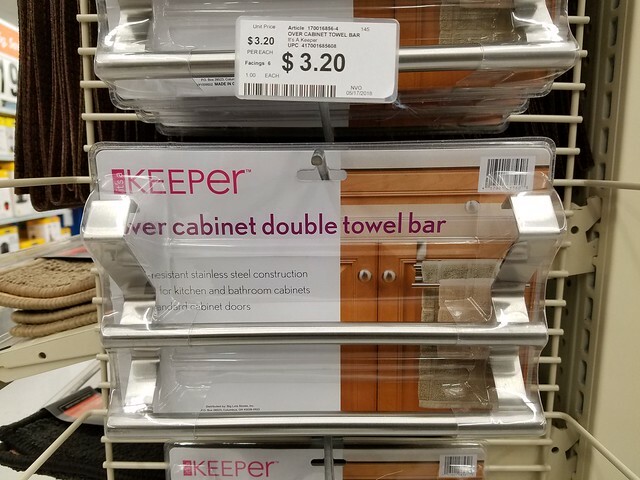 I was at Big Lots yesterday January 27th and saw the exact same dual towel bar sold under a different brand for real cheap.